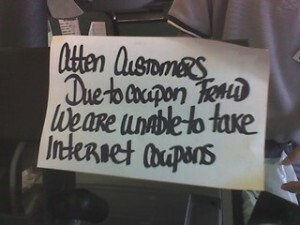 I haven’t talked alot about fake or fraudulent coupons, but, it’s important that you are aware. They are out there. Sometimes they circulate by email. If you receive a coupon that you think might not be legitimate, you can go to the Coupon Information Corporation and check it out. You can search for a product name and see the info and actual fraudulent coupon that is circulating, if there is one. Some things you can keep in mind when you get a coupon that is too good to be true is, if it is a pdf and you are not limited to how many you can print – be wary. 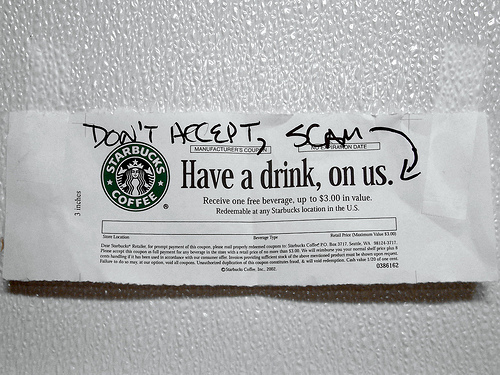 If it is for a FREE product – be wary, if it is a high value coupon for a large product – be wary. If there is no expiration date – DUH – that’s a no brainer! For instance I LOVE Ruffles, but, I rarely see a Ruffles coupon, if I were to get an email with ANY coupon for Ruffles, I would be wary because I don’t see them often. If that coupon were for FREE Ruffles, again, I would be very wary and check it out. Just use common sense, really. Manufacturers do not generally distribute coupons by email, nor do they tell you to print as many as you like, they send you an email telling you to come to their site and print out a coupon. The printable coupons that I have here on my site are from reputable coupon printing companies, and the manufacturer’s sites, too. I try to be careful and make sure that all the coupons I post here are legitimate. What’s the harm? Sadly, I have to answer this, because someone will think it! It’s stealing, plain and simple. It’s illegal and can get the person who passed it on to you in trouble and the person who tries to use it in trouble. Deep trouble – Criminal Prosecution and/or Civil Action can be taken against: INDIVIDUALS AND INTERNET SITES ATTEMPTING TO REDEEM, TRANSMIT, AUCTION, POST, REPRODUCE, TRANSFER, BARTER OR SELL COUNTERFEIT COUPONS MAY BE SUBJECT TO CRIMINAL PROSECUTION AND/OR CIVIL ACTION. We need to make sure that we are doing our part, because this is why stores often don’t want to take printable coupons and make it so hard on us who are doing it the right way. One bad apple spoils the whole bunch! What do you do if you get an email with a fraudulent coupon in it? Make sure to email the person who sent it to you and tell them it is fraudulent and what can happen if they pass it around and ask them to email everyone that they emailed it to and explain. Then forward the email with any attachments to the CIC. 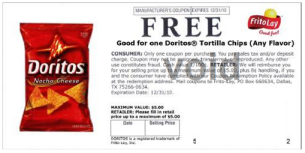 Here is a current fraudulent coupon that is making the rounds in email – be on the lookout: From Frito-Lay: “We have also been alerted to a fraudulent $5 coupon offer for Doritos chips that is circulating on the internet. This $5 coupon offer is not authorized by Frito-Lay. The invalid $5 coupon may not be accepted at retail outlets. We regret any inconvenience. 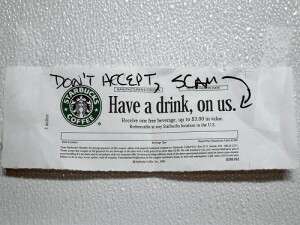 We’re working to find ways to prevent these types of counterfeit offers from misleading our consumers.” If you have noticed, the coupons that have been coming in the mail lately for FREE things we have signed up for, have holograms on them and watermarks, some have our names on them, they are really trying to make it clear that it is a real coupon as well as trying to make it harder for counterfeiters. So, be a part of the solution, not the problem. Help educate your friends and family who aren’t as coupon knowledgeable as you and that will make it easier on all of us! Thanks Michelle!